CardinalHealth Lubricating Jelly, manufactured by CardinalHealth, is a sterile, water soluble, Non-greasy lubricating jelly. This product replaces the Invacare Lubricating Jelly. Lubricating jelly can be used for a variety of medical or at home procedures. This product provides continuous lubrication that adheres well to it's surface and can be easily removed with a towel. This product provides medical professionals, caregivers and home users a lubricant that will not stain, is non-greasy and water soluble. It is sterile making it excellent for use where it will come in direct contact with the skin. It's water soluble property allows you to easily clean up any mis-applications or accidents. Makes gloved procedures and catheterization more efficient. 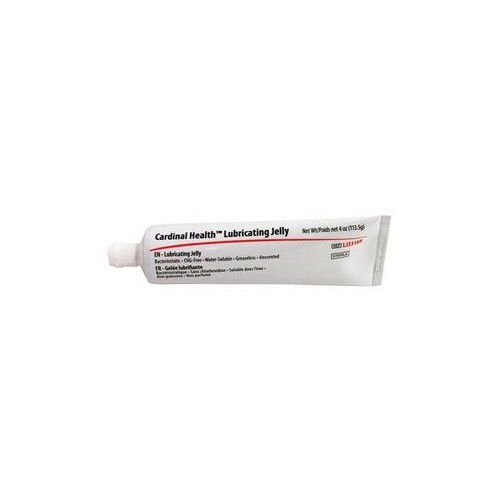 BUY Lubricating Jelly by CardinalHealth from Vitality Medical today. I ordered Reliamed and received Cardinal Health. Why? If you received an item other than what was ordered, please contact customer service so that we can resolve your issue quickly. Our customer service team is available at 800-397-5899. This specific item is made by Cardinal Health; however the two are sister companies. I was looking for the product that I had before Reliamed but eventually found that this product was the same but under a new name. It would have been nice to know that. It does not drip and is water soluble same as Reliamed. The price was excellent. There was a small problem with the shipment. It was divided into 2 shipments. There was no indication of that on the shipping label. There was no indication who the shipping company was in the email I received only a tracking number. So I could not track as I didn't know who was delivering it. But when I asked for the shipping company info so I could track the shipment, Vitality stepped up to the plate to straighten it out. and was willing to replace the order if need be. It was not necessary as I received the full order. But It would have been a good idea to indicate on the label that it was shipment 1 of 2 or some such indication that another shipment was on the way. That would have eased my mind. The only problem I have is the emails giving me a discount on my next order with a limited date. I will not be ordering for a period of time (passed the date) as I purchase an amount that I can justify the shipping cost. So I order an amount that will last me some time. Other than that I am happy with the price of the product and the communication with Vitality Medical was great! The shipping company not so much. If it had not been for my dog barking I never would have known that the shipping company left the box on my porch. Since I knew I was expecting a delivery, when my dog started to bark, I looked out the door to find the box left on my porch. I didn't see the truck. Called and indicated that my order was short and the customer service rep updated my order without question. Will continue to respect that kind of service. Thanks. I came back to Vitality to refill a Reclaimed lubrciant and could not find the product. I was initially very disappointed and spent a lot of time looking for the earlier product under the name Reliamed -- including searching if there were other suppliers than Vitality. After some aggravating time I found the product code under the new corp. name to be the same as my previous purchase , i.e. Reliamed. I assumed the that the product was the same but that it was being supplied by a different company with a different name. So I took chance and ordered. It turned out ok. BUT if a product is the same but under a new corporate name it would be gratefully helpful if this was noted/included in the Vitality product listing so rendering could be more efficient and less cumbersome. Best price on superior product! I've used this product for many years and it is superior to all others I've tried. The price here is by far the loser and delivery and service great. Great product and super fast delivery!! Did I say great price! Great product, great prices and quick delivery. I have never had any problems with this product and would recommend it to anyone. This is a great price on a good product I need for catheterization and they provide fast service also!! Ordered supplies necessary for me to continue good healthy living and they arrived fast even though i did not request fast delivery. Was supposed to arrive in 6-7 days and got them in about 3. That's what i call great service!